Ten-man Rotherham climbed away from the Championship relegation zone with a comfortable win at Huddersfield. The Millers opened the scoring through Kari Arnason, who bundled the ball past Alex Smithies at the second attempt. 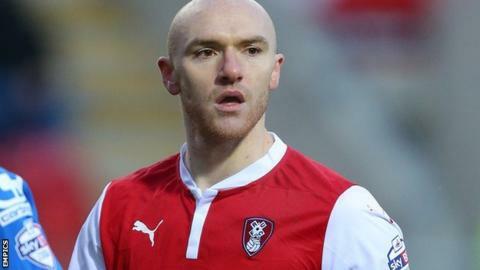 Conor Sammon doubled the visitors' advantage with a precise effort from the edge of the area before Millers captain Lee Frecklington was sent off for a second bookable offence. Radoslaw Majewski had the hosts' best chance late on but was off target. The win was Rotherham's first over Huddersfield in 23 years and saw the Millers move above Fulham, nine points clear of the drop zone. After a scrappy opening in which neither team enjoyed any real possession, Sammon tested Smithies with a close-range effort. James Vaughan had the Terriers' first meaningful effort but his looping header went wide, before Arnason, who saw an earlier header brilliantly saved by Smithies, fired home the opener just before the break. In the second half Vaughan had a first-time effort blocked before Sammon's strike gave Smithies no chance. The Millers' win was soured 16 minutes from time when Frecklington saw red for a late challenge on Conor Coady, having previously been booked in the first half for a foul on Joel Lynch. It mattered little as the visitors held out for a third away win of the season, while Huddersfield have now lost their last three matches. Huddersfield manager Chris Powell: "We have 10 games left and we must dig deep and try to pick up as many points as possible. A couple of weeks ago we moved into the top half of the table and maybe that gave us a false sense of security. "We know we must perform much better than that." Rotherham manager Steve Evans: "Even if we beat Wigan next week, anyone who thinks 43 points will be enough is certainly not Steve Evans. "We have had some disappointing results this season and we have to continue to work as hard as we have up to now." Match ends, Huddersfield Town 0, Rotherham United 2. Second Half ends, Huddersfield Town 0, Rotherham United 2. Substitution, Rotherham United. Frazer Richardson replaces Conor Sammon. Foul by Jordan Bowery (Rotherham United). Corner, Rotherham United. Conceded by Jack Robinson. Corner, Rotherham United. Conceded by Murray Wallace. Substitution, Huddersfield Town. Murray Wallace replaces Joel Lynch. Offside, Rotherham United. Richard Smallwood tries a through ball, but Matt Derbyshire is caught offside. Substitution, Rotherham United. Robert Milsom replaces Ben Pringle. Attempt missed. Radoslaw Majewski (Huddersfield Town) left footed shot from the left side of the box is too high. Attempt blocked. Jacob Butterfield (Huddersfield Town) left footed shot from outside the box is blocked. Assisted by Tommy Smith. Second yellow card to Lee Frecklington (Rotherham United) for a bad foul. Attempt saved. Jacob Butterfield (Huddersfield Town) right footed shot from outside the box is saved in the bottom left corner. Hand ball by Ben Pringle (Rotherham United). Kirk Broadfoot (Rotherham United) is shown the yellow card for a bad foul. James Vaughan (Huddersfield Town) wins a free kick in the attacking half. Foul by Kirk Broadfoot (Rotherham United). Attempt saved. Radoslaw Majewski (Huddersfield Town) right footed shot from outside the box is saved in the centre of the goal. Assisted by James Vaughan. Attempt missed. Matt Derbyshire (Rotherham United) right footed shot from more than 35 yards is high and wide to the right. Assisted by Conor Sammon. Attempt blocked. Sean Scannell (Huddersfield Town) right footed shot from outside the box is blocked. Assisted by Tommy Smith. Offside, Huddersfield Town. James Vaughan tries a through ball, but Ishmael Miller is caught offside. Goal! Huddersfield Town 0, Rotherham United 2. Conor Sammon (Rotherham United) right footed shot from outside the box to the bottom left corner. Assisted by Lee Frecklington. Substitution, Huddersfield Town. Radoslaw Majewski replaces Jonathan Hogg. Substitution, Huddersfield Town. Ishmael Miller replaces Joe Lolley because of an injury. Attempt saved. James Vaughan (Huddersfield Town) left footed shot from the centre of the box is saved in the centre of the goal. Assisted by Sean Scannell. Delay in match Joe Lolley (Huddersfield Town) because of an injury. Corner, Huddersfield Town. Conceded by Jack Hunt.